Well the capture season ended on Friday February 28, 2014 with maybe only 20 (?) horses being removed. We know of only three that were taken for slaughter. We can only hope that the rest were re-homed as claimed. I believe that the overwhelming outcry from Albertans and presence of the supporters who camped or attended at the rally camp, was the reason for it only being this number. 1/ In 2012 and 2013 there was a very high foal mortality rate. In those two years members and other supporters reported that at times there was maybe only one foal to every 30-40 adults. By 2013 even, the number of yearlings left, was down yet again. It was our argument that with these natural factors affecting herd growth there was no reason to go ahead with a culling of the numbers, especially with the ludicrous numbers that were scheduled to be removed. 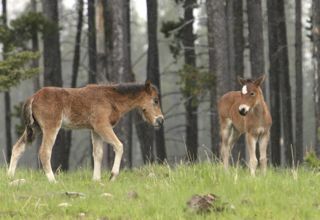 Since we agreed with the count presented, only moved up once, of 980 free-roaming wild horses in the vast expanse of Alberta Foothills, it would be an excellent start to track numbers and population growth or decline. Again this was ignored in favour of the cull concept of what the ESRD calls “management”. 2/ The current winter season started off harshly with unprecedented snow levels in the foothills and mountains where the horses live. Then came the cold! During this time the stakeholders’ meetings were still in progress to determine the “need” for a capture season. WHOAS, based on the previous reason, maintained that again natural factors were going to affect the herd numbers. It was also going to affect the reproduction rate of foals that would be born in the spring of 2014. Again this was ignored. The ESRD stakeholder meetings are going to continue with the next one scheduled for March 11th. Dr. Judith Samson-French has been invited to attend in order to present her initiative of a contraception program. WHOAS has thrown our full support behind this and will be funding what costs are necessary to get this program off the ground and running. Therefore, the government cannot say the cost of such a program is too expensive. On a side note, the ESRD spokesperson stated that they were evaluating more than one contraceptive and yet we know of only the one that Dr. French is proposing. WHOAS sincerely hopes that this contraception program is seriously considered and approved. It is our opinion that there is no reason for it not to be. It is an excellent and very humane management strategy for controlling your wild horse population where control is needed. Many of you have heard of WHOAS’ plan to purchase some land for a handling and education facility. 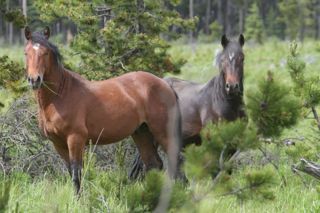 No matter what there will always be some areas where the wild horses do get into trouble and cause problems for private landowners, principally those who have land next to the forestry. As in the past, it is this small group of horses that sometimes cause negative opinions to arise about them. 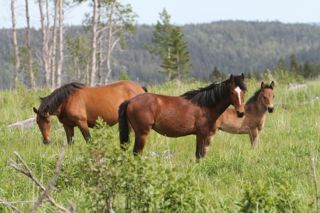 Previously WHOAS has helped relocate these horses, fixed fence lines, and purchased fencing equipment to help a landowner keep the wildies back on public land. We will continue to do this but for those ones that may need to be dealt with, this facility would allow it to happen in a safe and humane way. We recently received a request from a private landowner, and working through Mr. Theissen, WHOAS retrieved three of these horses, who were causing a concern on his land. These 3 right now are being kept on one of our member’s ranch while we work at gentling them so that they are safe to be adopted out. It is a possibility that the stallion may be entered in a competition for women where an unbroken horse is taken through the journey of becoming trained. Also every summer there are young foals that end up in difficulty separated from their herds. People on horseback or quads find them and rescue them and these young animals need a place that they can be gentled and adopted out to forever homes. So where do we go from here? No matter what happens with the contraception program, there is one obstacle that needs to be overcome. That is the status. Your wild horses need to have legislation put forth within the provincial legislature that would enable them to be a protected species. This could be with the designation “free-roaming wild” or “heritage”. It definitely has to change from the term “feral” which allows the opponents of these magnificent animals to continue with their negativity and hostile attitude toward them. WHOAS is working on a couple of strategies to move forward with this. Further, good independent research has to be done to fully understand what role and what effect these heritage animals do have on the ecosystem as it exists now in our Alberta foothills. After attending a presentation in Cochrane, February 28, the material presented was old or very biased against the horses. A lot of the claims made were still very misleading in allowing people to fully understand the wild horses and their home ranges. As in this presentation, it seems that they continue to look for the negative instead of the positive effect that horses do have on the environment. For example, they are reseeders, depositing unprocessed grass and sedge seeds in the devastated clear cuts where so many of them roam. The whole issue around the wild horses is not about how many there are or whether they are native or non-native. It boils down to one thing – money. So we encourage you to continue to let the government of Alberta and those in charge of your wild horse decisions, know how you feel. We have attached a couple of sample letters (in .pdf format) you can use as you wish. There is also no mention ever made about the fact the cattle are on the leases from May to October, virtually the entire growing season, or that a cattle unit is a cow/calf pair, with the calf eating an increasing amount of forage throughout the summer. Because the cattle are not removed until the very end of the growing season, there is no time got the grazing to regenerate enough to feed any of the wildlife through the winter. I did see one paper which stated that 980 horses ate the equivalent of 3425 cattle. This would mean 1 horse eats the same as 3.5 cattle. According to a friend of mine who has been a cattleman for most of his life, this number is reversed. For example, a horse will eat half a square bale of hay a day whereas a cow will eat 2 bales. Misinformation is the bane of these horses existence. I also notice there is never any mention of the Forestry companies using herbicide to clear vegetation before tree planting. I hope we can start to have honest discussions on the subject of these wild horses, they have been the victims of spin doctors for far too long. Hi Bob…..love what you have had to say here! While there are other people and groups now involved I have listened to you speak in the past and have had conversations with you as well and your passion and drive is just beautiful! I believe that you are still the most knowledgable and should continue to lead us into the future of our wildies. I have a lot of respect for what you have done and what you continue to bring to the table on all the issues at hand. I look forward to seeing you again soon! 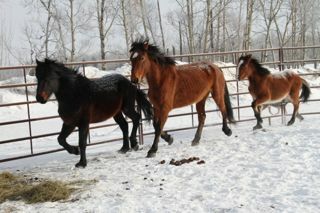 Keep up the incredible momentum that is now galloping across Alberta and Canada to protect the wild horses! I hope everyone who reads the March-April 2014 Horse Canada review of the “Free Spirits, Wild Horses in Canada: Pest or Precious Heritage?” will write to governments and keep the conversation alive to stop our horses from being horrifically captured, trucked and usually slaughtered by order of our governments! 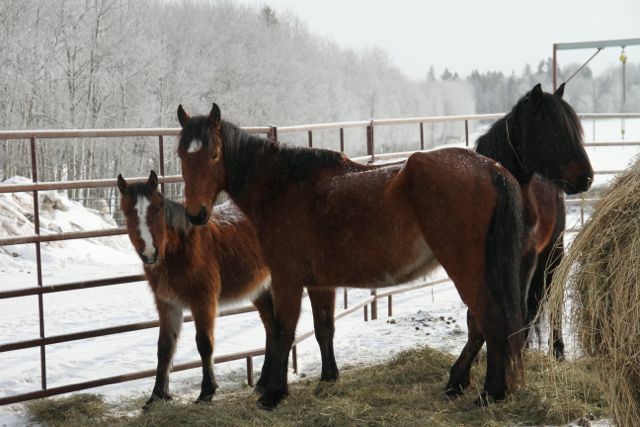 The media coverage in Alberta this year has been constant, which helps to keep our free-roaming horses in the minds of the public,equestrians and animal lovers. Had I known about the protests in advance, I certainly would have marched along! I will be renewing my membership and hope to help in whatever way you need to be a voice for the wildies! Well done Bob, WHOAS members, friends, media personnel, and also to Jann Arden for the excellent awareness campaign! There is an interesting article in Horse Canada about the Wild Horses of Canada, the focus of the article on Alberta’s horses was near Bragg Creek, where it was stated, for every horse there is around 12 head of cattle on public lands, around 131 horses and around 1600 cattle. Seems to me the horses are not making the biggest impact on the environment! Sad thing is, if you drive around central Alberta you see a lot of empty fields, not many small farmer’s are raising cattle any more, most are in the hands of corporate ranches and lots, who for some reason are running them on public lands. What was the outcome on the horses in the Nordegg area? I admire your passion and drive to save our wild horses. These magnificent animals are to be respected and their status in our province protected. I just hope the government can see the need for this before it is too late. Thanks for all your work and I will be submitting my membership to the Society! Bob, you have been fighting for the wildies since I first met you, in fact, you brought their plight to my attention. I too admire your passion and drive. I believe that without what you have done for the wildies in the past, we simply wouldn’t have any left. Thank you for your continuing work. I am glad it is all coming to light. I am tired of the misinformation that people have about these horses. Cattle are by far more destructive. I ride in the Sandy McNabb area and there is so much destruction caused by the cattle. Trails are desecrated. About 15+ years ago I used to see a lot of the big horn sheep. Now, I have yet to see one anywhere in that area. Humans seem to think that they are more important and unfortunately, the animals lose every time.